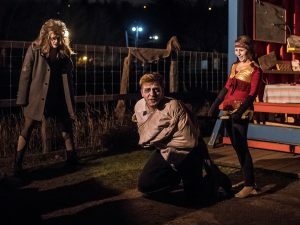 Over the past decade, Dead Centre of Town has grown from a one night only pop-up production staged in a bar on Halloween, to a fully fledged 34-show run in Edmonton’s premiere living museum. To the audience who joined us in the park after dark, thank you. For supporting live theatre. For an insatiable interest in Edmonton’s history. For celebrating the Halloween season with us. To our cast and crew who dedicated countless hours, passion, and sometimes even sweat and tears, thank you. For helping bring our wildest imaginings into reality. For putting on one hell of a show despite the sometimes daunting conditions. For breathing life into Edmonton’s dark and sordid past time and time again. It’s hard to believe how far we’ve come in the last 10 years, and exciting to imagine where we might be 10 years from now. One thing we know for sure: we’re just getting started. 2017 marks the 10th anniversary of Dead Centre of Town. Dead Centre of Town X took place in the 1920s Johnny J Jones Midway at Fort Edmonton Park. 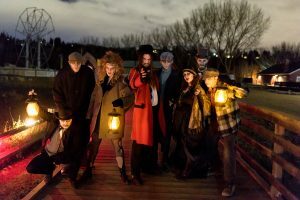 Below is a brief synopsis of the stories told this year, all inspired by true history and urban lore of Edmonton’s past between the years of 1918 and 1926. Felicia Graham was last seen crossing the High Level Bridge on November 15, 1918 after leaving the Marchand Mansion, supposedly on her way to a south side shelter for Edmonton victims of the Spanish flu epidemic. A passerby reported that when Felicia reached the middle of the bridge, she disappeared. Representatives from the school board reported she jumped, but her father refused to believe his dear daughter would take her own life. He published ads in the local paper offering a hefty reward for her return. Sightings of her were reported across the country, though she was never seen by her family again. Known as a serial killer by way of lethal matrimony, James Watson was believed to have married 40 different women, and was thought to have killed as least 25 of them between 1918 and 1920 in cities and towns across Canada and the northern US. Though he only ever admitted to nine, it was the box of love letters addressed to his dearly departed wives left behind in his Arlington apartment (apartment number 14) here in Edmonton that finally did him in. It’s thought that the spirits of his slain wives haunted that old building until a suspicious fire roared through the Arlington in the early 2000s. Interestingly, it’s rumoured that Felicia Graham disappeared at the same time James Watson was living in Edmonton…strange coincidence, no? Filumena Lossandro is the only woman in Alberta to ever hang. She swung from the gallows on May 23, 1923 at the tender age of 22. All because she fell in love with the wrong man (infamous rum runner Picariello, or Emporer Pic to close acquaintances). They never did prove who fired the gun that killed Constable Dawson. And no on believed that Filumena was the one to pull the trigger. It’s true, ladies’ Tea Parties from across the province wrote letters petitioning her sentence, and even the Franciscan Priest who attended her cell believed her to be innocent. Did they let an innocent woman hang? 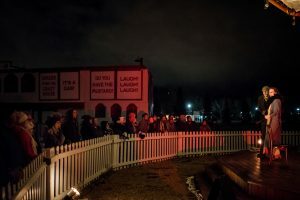 Story goes, back in 2000 a program coordinator with the Fort Saskatchewan Museum capture Filumen’a spirit in two pictures taken during a children’s Halloween sleepover, the faint image of a woman’s head floating over the bodies of the sleeping children in the same location where the gallows once stood. On May 25, 1920, the Christy Brothers Circus Train fell off the track in Cardston, Alberta, just a few hours outside of Edmonton. Although it’s undocumented how many were injured or lost in that particular incident, it’s believed that both performers and animals died the crash. T’was a common occurrence back then – the rail claimed more than it’s fair share of freak show folk and circus animals. Fourteen elephants belonging to the Sells Floto Circus broke free from the CP Rail Yard on a hot August day back in 1926 after being spooked by a yappy fox terrier. The herd stampeded down Jasper Avenue causing massive damage in their wake. It took circus staff all day and all night to retrieve the animals. Mad Mary, the smallest but liveliest of the herd weighing a mammoth 3,000 pounds, tormented the streets till sunrise. It was reported that not a man among them could stop her rampage. And so, they simply left her to her flight of frenzy. Eventually, she caught herself in the Cushing Brothers lumber yard, where she flipped several trucks, and tore a steel door from its hinges. In the early morning, the Sells Floto elephant men brought Trilby, the boss elephant of the herd, to the site. Trilby wrapped his trunk around Mad Mary and, at last, she stood still. Despite the hullabaloo and panic, the circus was staged on time. Though entirely undocumented, this small treasure of word-of-mouth urban lore came to us by way of multiple sources. 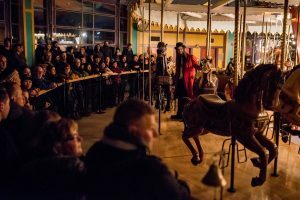 Story goes, one particular carousel horse was so difficult to carve that numerous carvers injured themselves, to the point where the horse sat unfinished in the shop for months on end. No one would go near it because it was believed to be bad luck. We’re told it took five different carvers to finally finish the horse. That particular horse is currently the only one on the carousel raring it’s head and gnashing it’s teeth. 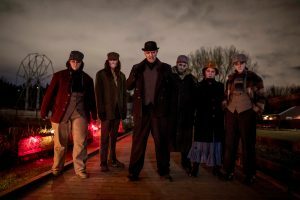 We lovingly call our ghastly guides “Henches.” These skilled performers are responsible for ensuring the audience’s safety, while keeping the intricate mechanics of the show on track. Dead Centre of Town has evolved from an enclosed, one-room performance, to a roving, rotating, immersive Rube Goldberg live theatre machine. 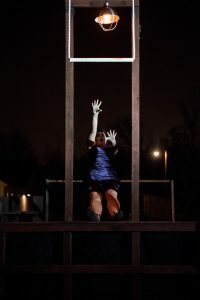 Our Henches are an invaluable part of the creation process, and the audience experience! 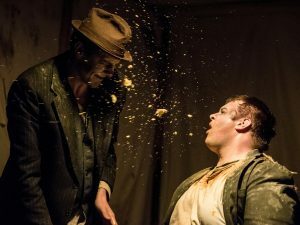 These not so motley folk bring a broad cross-section of talent and skill to Dead Centre of Town, from specialized theatre, movement and fight training, to sound design, costuming, special effects development, carpentry, and engineering. 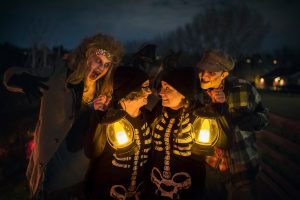 It took a running crew of seven to keep the magic on track this year, and though you might’ve seen them lurking around dark corners, chances are you didn’t realize they were the magicians behind the dark magic. 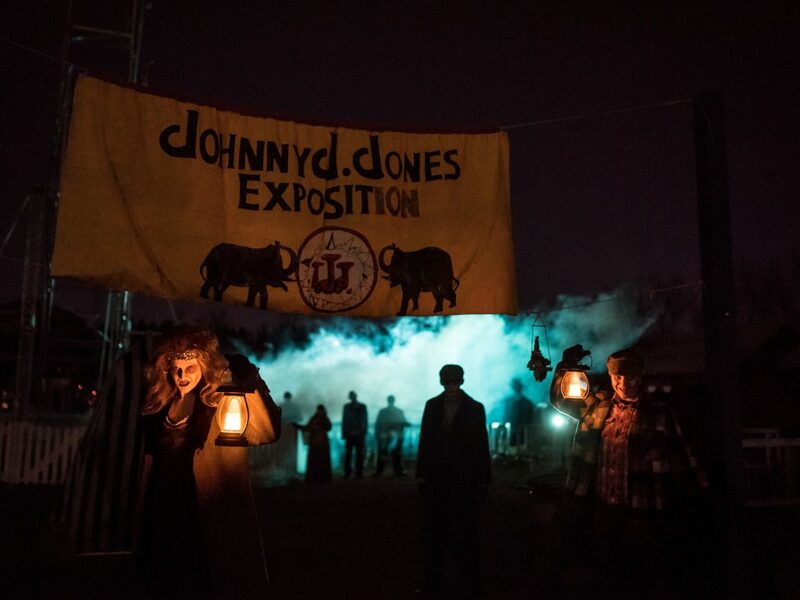 The Johnny J Jones Midway at Fort Edmonton Park (2017), dedicated to the Edmonton Exhibition of 1919. 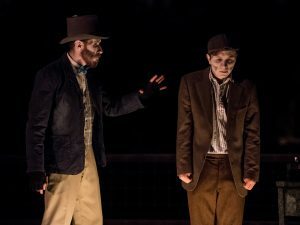 The growing success of Dead Centre of Town is undeniably due to its committed and passionate company members, and our amazing audience! Over the course of 10 years, we’ve had actors, designers, technicians, and even audience members return year over year, some of whom have been with us since the very beginning. To call it a passion project would be a gross understatement – our collective is fiercely dedicated to this project, and each bring a wealth of skill and knowledge, a passion for local history, and a refreshed energy to the production each year. 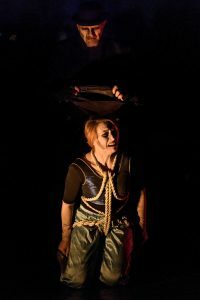 Jim & Katherine Heisler, Michael Machan, L’Uni Theatre, Tyler Ferguson, Anne Wenschlag, Chris Kavanagh, Adam Mitchell, Edmonton Fringe Theatre, Sheiny Satanove, Chris W. Cook, Paul Blinov, Liam Coady, Vern Theissen, Marian Brant, Workshop West Playwrights’ Theatre, Matt Schuurman, Mary & Tim Schuurman, Alice Schuurdart, Julie Ferguson, Steve Pirot, Marc Chalifoux, Ian Jackson, Teresa Ryan, Mark Hill, Joe & May Carter, Fort Edmonton Park staff and volunteers, and the generous support of the Alberta Foundation for the Arts. All photos credited to Marc J Chalifoux Photography.